Dual port RJ45 connector, PCIe 2.0 x8 interface, Drivers for all major OS, 3 year warranty. 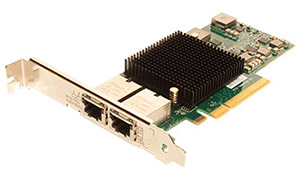 FastFrame NT12 provides lossless ethernet (CEE) and Data Center Bridging (DCB) support provides improved iSCSI quality of service, for reliable access to storage. This enhanced iSCSI support makes FastFrame the ideal solution for, wiring closet/small data center installations, an existing NAS-dominated network, want to add network access to block data for remote offices, or to support IP routing over longer distances and ease installation and management for local IT admins.